Nigeria's President Muhammadu Buhari is re-elected for another four-year term. His main competitor, Atiku Abubakar, has called the election a "shame" and promised to challenge the outcome in court. Here are five things we have learned from a choice that is appalled by controversy. With 73 million could vote, this could have been Africa's largest ever election – but only a third of the voters appeared. So what was billed as a record break the election broke records, but for a completely different reason. The General Assembly in 2019 recorded the lowest turnout in Nigeria's 20-year history as a democracy. Nationwide turnout has been steadily declining since 2003. The general decline – especially in the south – could indicate a declining belief in political establishment and what it can deliver to the people. Stemmerapati seems to have stopped. Atiku Abubakar, who stands in front and the main competition, says there was a mistake in voting votes. He says it is curious that the total number of votes in one of his high citizens, Akwa-Ibom, was 50% lower in this election than it was in 2015. Mr Buhari usually has significant support in the north of the country where he is seen as a principled man of the people. His speech has been consistent there for the last five presidential elections. Turnout was significantly lower in Nigeria's southern regions, where Mr Abubakar had hoped his numbers would rise. 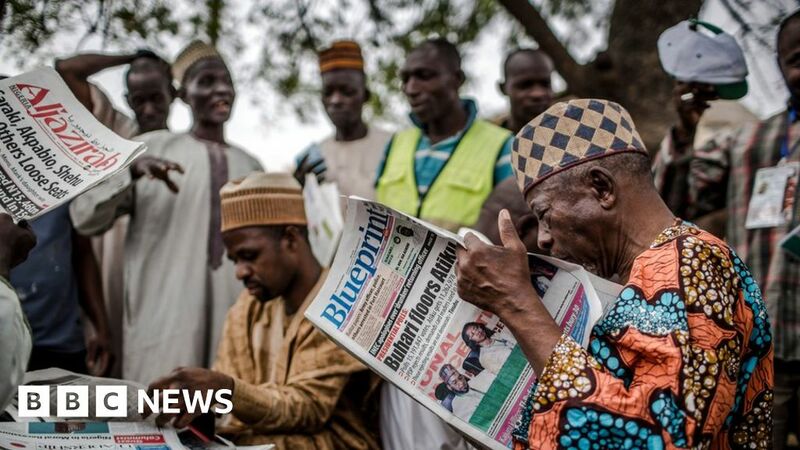 He won in the south, but not with a large enough margin to cut Buhari's management by four million votes.
. Abubakar also questioned why the northern parts ravaged by the Islamist militia group Boko Haram had high voters. Borno and Yobe states in the Northeast are fortresses of the governing All Progressives Congress (APC). Their support has not gotten used to, although security concerns have displaced two million people. The Independent National Electoral Commission (Inec) allowed the 400,000 internally displaced persons to vote in or around their camps. The region provided large numbers despite attacks on the election day of Boko Haram and its offshoot, the so-called Islamic state West Africa Province (ISWAP). Inec delayed election day by one week due to logistical problems. This triggered complaints from people who had already traveled to their hometowns to vote, and now they had to travel twice. However, this would have affected both candidates accordingly. Some analysts suggest that the use of electronic voting systems has made human error and manipulation more difficult. Although reports of electronic voter verification devices have been reported, many believe that the use of technology has helped to understand voters and their true voting behavior, as well as to combat voter fraud.